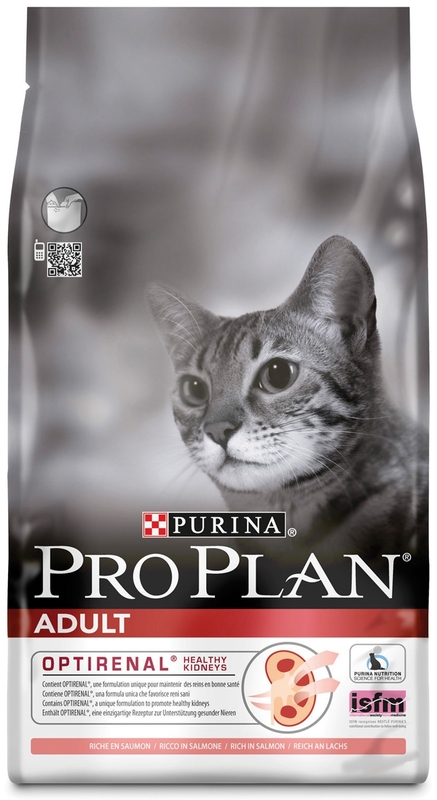 PRO PLAN ADULT combines all essential nutrients including vitamins A, C and E, also omega 3 & 6 fatty acids and a natural prebiotic in a high quality diet for cats. PRO PLAN provides a complete, balanced diet which promotes a healthy and happy life for your cat. OPTIRENAL is a scientifically designed combination of ingredients which promotes healthy kidneys. The high protein content helps to nourish the cat's muscles which helps them to keep a lean body condition. The coat stays nourished from the combination of essential nutrients, and the teeth are protected from plaque and tartar build-up by the crunchy kibble and special minerals contained within. For the healthy maintenance of adult cats. Salmon (18%), maize gluten meal, rice, dehydrated poultry protein, maize, wheat, animal fat, dried egg, dried chicory root* (2%), minerals, wheat gluten meal, digest, yeast. Feeding quantities required to maintain ideal body condition will vary, depending on age, activity and environment. Watch your cat's weight and adjust food amounts accordingly. Clean, fresh drinking water should always be available. For your cat’s health, consult your veterinarian regularly. There are currently no questions for Purina Pro Plan Adult Rich in Salmon with OPTIRENAL Cat Food - be the first to ask one!